STEVENAGE, UK (ANS – May 5, 2016) – A leading British political figure, The Rt. Hon. the Baroness Anelay of St Johns DBE, Minister of State at the Foreign & Commonwealth Office (FCO), and the Prime Minister’s Special Representative on Preventing Sexual Violence in Conflict, has been received by His Grace Bishop Angaelos, General Bishop of the Coptic Orthodox Church in the United Kingdom, at The Coptic Centre in the Stevenage, UK. 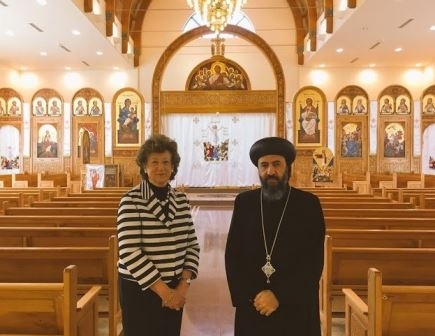 After a tour of the Cathedral of Saint George with the Baroness, Bishop Angaelos said: “It was a pleasure to welcome Baroness Anelay to our Centre and have an opportunity to discuss collaboration for the most vulnerable. Following the visit Baroness Anelay said: “I was delighted to visit the Coptic Orthodox Church Centre and learn more about the Coptic Orthodox Church and British Coptic community, as well as His Grace’s role in bringing together Middle Eastern Christian leaders from different denominations. The Coptic Orthodox Church in the United Kingdom dates back to August 10, 1954, when the first Liturgical service was prayed in London by delegates representing the Coptic Orthodox Church at the general assembly of the World Council of Churches. In February 1969, an historic Liturgy was prayed in London by His Grace Bishop Shenouda (the late Pope Shenouda III) who encouraged the faithful to carry out regular services which subsequently led to the hiring of St Andrew’s church in Holborn, London. Many would gather from across the United Kingdom to pray there until 1978, when, returning to London as Pope, His Holiness Pope Shenouda III consecrated St Mark’s Coptic Orthodox Church in Kensington, London, the first Coptic Orthodox Church in Europe. Since then, the Coptic Orthodox Church in the United Kingdom and the Republic of Ireland has grown exponentially, with three dioceses that serve approximately 20,000 faithful across 32 parishes, with the number constantly increasing. The diocese of the Midlands in the United Kingdom and its Affiliated Regions is overseen by His Grace Bishop Missael, while His Grace Bishop Antony presides over the Diocese of Ireland, Scotland, North East England and its Affiliated Regions. The Papal Diocese, under the care of His Grace Bishop Angaelos, covers all remaining parishes in the United Kingdom. His Eminence Metropolitan Seraphim oversees the British Orthodox Church, which is a non-geographical diocese of the Coptic Orthodox Church. The Coptic Orthodox Church in the United Kingdom and Republic of Ireland is an interactive member of its community, serving people of all ages in a variety of ways across the four nations, equipping people to be faithful citizens and active members of their local communities. Among the various services that the Church provides are spiritual, pastoral care, advocacy and benevolent work, and youth ministry. Bishop Angaelos was born in Cairo, Egypt and emigrated to Australia during his childhood with his family. He later obtained a degree in Political science, Philosophy and Sociology, continuing on to postgraduate studies in law while working in the same field. In 1990, he returned to Egypt to the monastery of St. Bishoy in Wadi-El-Natroun, where he was consecrated a monk by the late Pope Shenouda III and served as his private secretary, until 1995 when he was delegated to serve a parish in the United Kingdom. With a pastoral ministry that spans almost two decades, Bishop Angaelos travels extensively around the world to speak at various youth conferences and conventions. Since being consecrated a General Bishop for the United Kingdom in 1999, Bishop Angaelos has been active at local, national and international levels, while also working extensively in the area of inter-religious relations. Specializing in initiatives relating to advocacy, human rights and development work, Bishop Angaelos is a member of, and chairs, numerous local, national and international bodies dealing with these matters. As director of the Media and Communications Office in the United Kingdom and Europe, Bishop Angaelos frequently issues statements and comments relating to current religious and minority issues with his particular focus on dialogue, conflict-resolution, and reconciliation. In recent years, the views of Bishop Angaelos on matters relating to the Church in Egypt, the Middle East and North Africa have been increasingly sought by the local, national and international community. She was appointed Minister of State with responsibility for the Foreign & Commonwealth Office in August 2014, and as the Prime Minister’s Special Representative on Preventing Sexual Violence in Conflict in June 2015. Prior to this she was Chief Whip in the House of Lords and Captain of the Honourable Corps of Gentlemen-at-Arms. She was made a Privy Counsellor in 2009. Lady Anelay is a Conservative member of the House of Lords. Lady Anelay was raised to the peerage in 1996 and served as an Opposition Spokesperson for various departments until being appointed Opposition Chief Whip in 2007. For more information, please contact the Media and Communications Office of the Coptic Orthodox Church Centre UK at Tel. : +44 (0)207 1937076, or by e-mail at: Media@CopticCentre.com. The website is: www.CopticCentre.com. Photo captions: Bishop Angaelos in discussions with Baroness Anelay. 2) A memorial service for His Holiness Pope Shenouda III, 117th Pope of Alexandria and Patriarch of All Africa on the holy Apostolic See of Saint Mark the Evangelist, who died on March 17, 2012. A memorial service for the United Kingdom, celebrating his life and ministry was held on Saturday 24th March 24, 2012, in the Cathedral of Saint George at The Coptic Orthodox Church Centre. 3) Bishop Angaelos with the Archbishop of Canterbury, the Most Revd. and Rt. Hon. Justin Welby at Lambeth Palace in London. 4) Dan Wooding with Norm Nelson of Compassion Radio at the pyramids at Giza in Egypt. 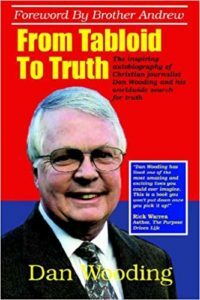 About the writer: Dan Wooding, 75, is an award-winning winning author, broadcaster and journalist who was born in Nigeria of British missionary parents, and is now living in Southern California with his wife Norma, to whom he has been married for nearly 53 years. They have two sons, Andrew and Peter, and six grandchildren who all live in the UK. Dan is the founder and international director of the ASSIST News Service (ANS), and is the author or co-author of some 45 books. Dan has a radio show and two TV shows, all based in Southern California, and has reported from Egypt on several occasions.